Nowadays global markets and expedited shipping methods expose packages to less than ideal conditions during the transport process. International Safe Transit Association (ISTA), International Air Transport Association (IATA), International Organization for Standardization (ISO) and American Society for Testing and Materials (ASTM) all contain protocols and requirements used to evaluate product package design. 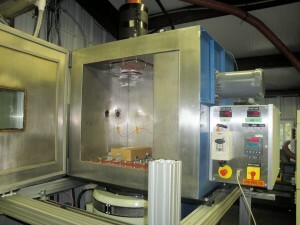 Some of these test profiles require combined environments such as combined temperature and vibration testing. This type of testing requires specialized equipment, set up and experience from the lab conducting the test. DES recently performed a combined temperature and vibration package test according to ISTA 3A Over-The-Road Trailer Spectrum for a pharmaceutic company looking to evaluate their package design. Utilizing our combined temperature and vibration test set up we were able to successfully perform random vibration tests on their packages at 60 °C. The vibration profile specified a frequency range from 1 to 200 Hz at 0.53 Grms. This was a relatively simple test given DES’s capabilities. Package tests using combined temperature and vibration, however, is a special capability uncommon to many package test labs. Temperature ramping as well as hot and cold dwells can also be incorporated depending on your reliability needs. For more information on Package Testing please contact DES or call 610.253.6637. This entry was posted in Combined Temperature & Vibration, Test Standards, Vibration & Shock Testing and tagged package test by DES. Bookmark the permalink.